What is DBAN and Why Use It? 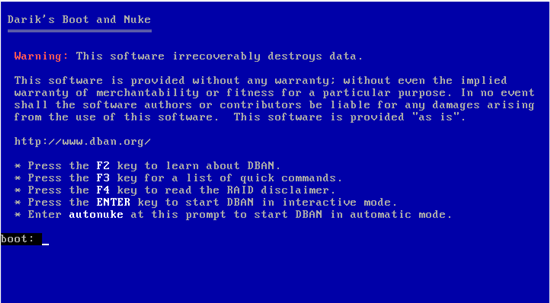 Darik’s Boot And Nuke (DBAN) is a bootable utility which can be used to securely wipe all mechanical hard drives attached to a system. The end result is that it will remove absolutely everything on the hard drive making it essentially blank, like when it was manufactured. I recommend using DBAN for users that are planning on selling/giving away their system or reinstalling due to a viral/malware infection or for those who want the ultimate clean install. 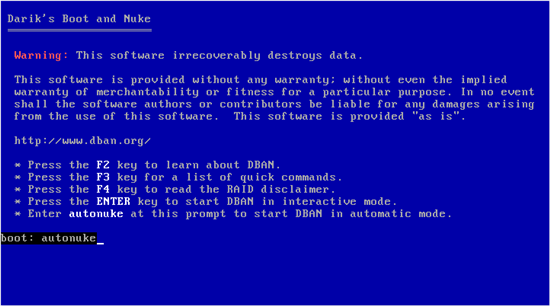 DBAN permanently erases data* and is far more through than the standard Windows format. * Note it is not guaranteed to securely wipe your system but in my limited testing has done a pretty good job. 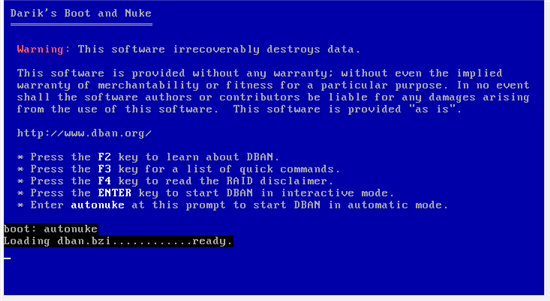 Note DBAN does not work for a Solid State Drive. 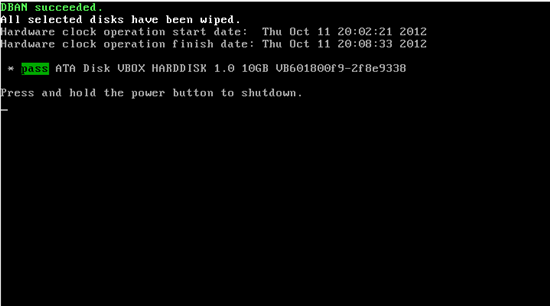 DBAN will wipe all internal hard drives essential leaving them blank. DBAN will also wipe any attached USB Storage devices such as external hard drives, USB Flash Sticks and memory cards even the Bootable DBAN USB you use to securely wipe the system will be wiped so take extreme caution when using this program. Newer systems (~2012 or later) which come with a Secure Boot UEFI enabled BIOS which will prevent DBAN from booting. These are newer security technologies which only allow 64 Bit code with a Microsoft signature to boot. Codes without such a signature will be rejected and so only only certified code will boot. This makes the boot process secure preventing malicious code from booting. Note: Remove any other external USB Hard Drives and USB sticks unless you want to securely format them too. Older versions of DBAN usually failed with systems which had card readers. This was because it searched for a blank drive and attempted to wipe nothing and hence stalled. This is mentioned as fixed in release 2.2.8 so you don’t need to disable card readers in the BIOS setup when using the latest version. Insert a USB stick >0.5 GB and launch Rufus. It will say done at the bottom left when finished, you may now close Rufus. Windows 7 and Windows 8.1 have native .iso burning to CD/DVD capabilities. Select your Optical Drive and select Burn. You will be informed your disc is ready, select close. You will be informed when your disc is ready, you can now close ImgBurn. Insert the DBAN CD/DVD or USB and power down your system. 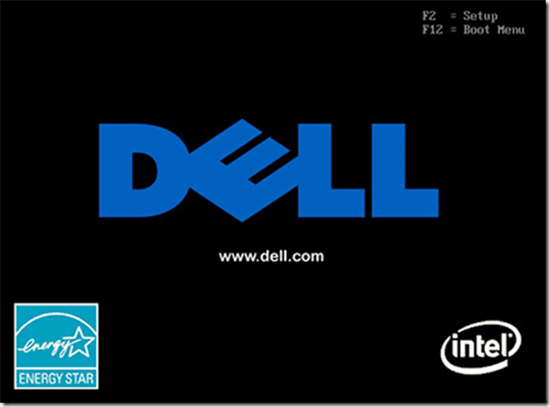 Press F12 at the Dell BIOs screen and select boot from CD/DVD or from USB respectively. The easiest way to use DBAN is by typing autonuke and then pressing enter. DBAN will then begin to securely format your hard drive. Note DBAN can take a very long time to securely format a large capacity hard drive so I usually leave it running overnight. When completed you should get a screen like this. Hopefully it will say DBAN succeeded although sometimes it mentions an error. Most of the times that it has mentioned an error to me it has actually fully formatted the drive and ran for the same length of time as it should (i.e. the same time for a system of the same model where no error cropped up). This worked for me. I couldn’t get effing Windows 7 off my PC and reinstall XP (old programs are sometimes better). This got rid of that horrible OS for good. Thanks!